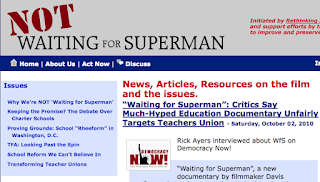 Teachers For Social Justice: NOT Waiting for Superman - Take Action! 1. Write a letter to the editor or an op-ed. The editorial page is a powerful forum for countering influence and finding solidarity. Davis Guggenheim is a storyteller, but you need to tell your own story, and the editorial page is an excellent place to start. We offer FREE assistance to writers who need help framing, editing and placing a letter or op-ed. 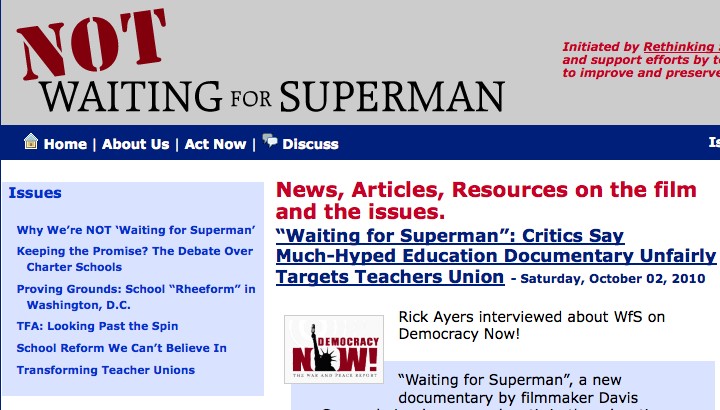 Contact Fred McKissack at fred@Notwaitingforsuperman.org for more information. 2. Pass out leaflets at the theater. On-the-ground, direct action is a hallmark of American democratic values. Passing out leaflets gives moviegoers something to absorb as they are bathed in Guggenheim's oversimplified emotionalism. You can find ideas and samples of leaflets here. Note: it's important to include local contact info. 3. Invite others to watch better documentaries. 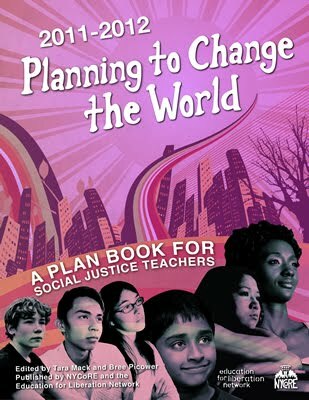 You, too, can bring people together to watch a documentary or two that treats the subject of education reform as a complex problem that requires a holistic approach from the entire community, not as a pet project for the wealthy. Here are four we recommend. 4. Join the discussion about the movie. Even if you haven't seen the film, you can provide context to why the reforms touted by this film will be the demise of public education. Below are places you can start. 5. Join the discussion about education policy. Let your voice be heard in contrast to so-called reformers and their acolytes who frame the debate with dubious claims and specious arguments.